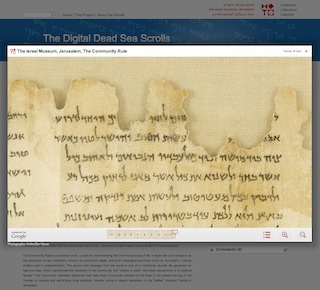 This looks like it’ll be a fantastic resource: the Digital Dead Sea Scrolls at the Israel Museum. Still many more manuscripts to go, but a fantastic start, and just in time for the Dead Sea Scrolls Conference in Memory of Emeritus Professor Alan Crown to be held in about one month’s time. This entry was posted in bible, dead sea scrolls, old testament. Bookmark the permalink. Martin, I really appreciated your erudite and gracious engagement with Jon Sorenson recently – though you will not have persuaded him, I think you will have encouraged many other readers. Your scholarship leaves me feeling distinctly inadequate though, and I’m a reasonably experienced apologist and debater. Where would I go to find the kind of historical apologetics – specifically, detailed reference to original texts etc. I know this is part of your field of study and I won’t pick it up in a few short weeks, but I’d love some pointers.